Migrated women made a family with Koreans and they are learning Korean language and culture as sound members of our society. Now they can be easily found in cities as well as in countryside. Kimchi is Korea’s national food and the most necessary food for winter. To help the wives of multicultural families learn how to make kimchi and to deliver kimchi that is made with mother’s love and wholeheartedness to the multicultural families in need, the members of the Intl. WeLoveU Foundation rolled up their sleeves. 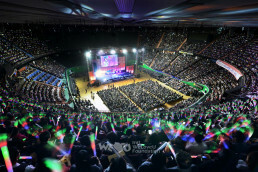 On November 22, the Intl. 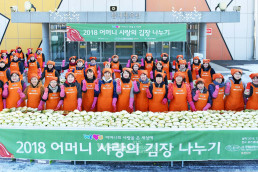 WeLoveU Foundation, which has helped its neighbors by giving them kimchi for winter every year, held the 2012 Kimchi-Making Festival to Share Mother’s Love with Multicultural Families in the Yeouido Park, Seoul. 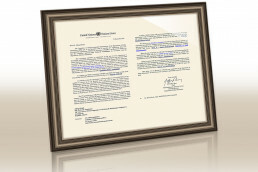 Chairwoman of the Intl. 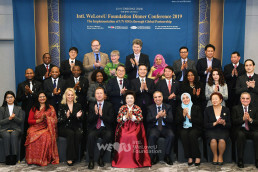 WeLoveU Foundation Zahng Gil-jah, Goodwill Ambassador Kim Seong-hwan (actor), PR Ambassador Lee Seong-hun (vocalist) and the first migrated woman lawmaker of Korea Lee Jasmine took part in the festival and encouraged the members. It was Soseol (which is one of the 24 solar divisions of the year, meaning “light snow”), but the weather was mild under the warm sunlight. The salted Korean cabbage for that day was around 15,000 kilograms [33,000lb]. Chairwoman Zahng Gil-jah and the members trimmed, washed, cut and salted the cabbages from three days before and brought them for the day. Kimchi seasoning were prepared in advance by mixing tasty and healthy ingredients—red pepper powder that is not too spicy by considering the taste of migrated women, oyster, shrimp, squid and pear. As the worktables were set and the piles of cabbages were spread on it, it seemed that the cabbage field was there. Chairwoman Zahng Gil-jah and the members are making kimchi together with the wives of multicultural families. Goodwill Ambassador Kim Seong-hwan (actor) is at the middle in the photo. Chairwoman Zahng Gil-jah and the members are carrying kimchi together with the wives of multicultural families. After finishing kimchi-making, the WeLoveU Foundation members and migrated women took a commemorative photo. When they wore a smile, saying “kimchi,” they truly were the people of “our country”—our family living in the global village who share mother’s love and warm-heartedness and eat kimchi together with us. Chairwoman Zahng Gil-jah and the members are making kimchi together with the wives of multicultural families. Chairwoman Zahng Gil-jah and some members visited several multicultural families in Yeongdeungpo borough in the afternoon and delivered kimchi, rice, other food and daily necessities. Coming from the Philippines, Vietnam, Cambodia or China, most of them were newlywed brides who have just become the mother of a baby, and it was hard for them to make kimchi by themselves because the mother-in-law is old and sick or some other reasons. “The WeLoveU members made great effort to make this nutritious kimchi. I wish you to enjoy this during the winter and be healthy,” saying this, Chairwoman Zahng Gil-jah delivered kimchi. Having a friendly talk with the multicultural families, she asked the daughters-in-law who are migrated women to depend on their mothers-in-law as if they were their mothers, and asked the mothers-in-law to understand and love their daughters-in-law who live in a strange and foreign land even though it was hard to communicate with them. Park Byeong-yeon, 74, who said that she was worried because she could not make kimchi for winter as she had a backache, thanked the members for helping them. She understood how much effort we should make for Gimjang. She also said that she would try to learn the Philippine language to know more about her good daughter-in-law. Her daughter-in-law Jennis, 27, made the members laugh by saying, “My mother-in-law is good, too,” and said in Korean that now she could speak fluently. On the day after the kimchi-making festival, Chairwoman Zahng Gil-jah invited 150 WeLoveU Foundation members who are of multicultural families to the Daedeok Glory Building in Bundang, Seongnam City, and delivered them kimchi and mufflers, and held a luncheon. Chairwoman Zahng Gil-jah welcomed the multicultural family members and comforted them, saying, “I think you’ve gone though many difficulties since you came to a foreign country, and experienced different culture and weather.” She also said, “People say that this winter will be very cold, so I hope you enjoy this kimchi we made with love, and spend this winter warmly and healthy.” She also asked the members to “give much love to others and bear a lot of fruit of love.” When she warmly encouraged them and held their hands, some members were moved to tears. Aubertina, 42, Suwon branch, said that she felt mother’s love when she received gifts on this day, and expressed her thanks, saying, “When I followed my husband to a Korean restaurant in Peru, I tasted kimchi and I came to love it from that time. I’ll enjoy this kimchi with my family.” Hauksureng, 67, Yongin branch, who was in Mongolian traditional clothes “del,” said, “I’ve received much love and courage. I give thanks to the chairwoman and the Korean members for preparing this event.” Although they have different nationality, the multicultural family members, who make efforts for the volunteer activities we carry out with love and smile together with us, are all our precious neighbors and our family.